Curious, considering our national reputation, that of all the street markets in London only one should sell dogs. This can be found any Sunday morning by taking a bus to Shoreditch High St and following your ears. a cacophony of whimpers, yaps, yelps and just plain barking will guide you to the spot where Bethnal Green Rd branches off to Sclater St. There you may find them – the unclaimed pets of a hundred homes : new-born litters of puppies tumbling over each other in children’s cots ( the most popular form of window display) : “mixed bags” of less lively youngsters huddling docilely together in laundry baskets; lively-looking sheepdogs, greyhounds and bulldogs straining at the ends of leashes and furry little faces peering incongruously from the jackets of hawkers, who often look as if they’d be happier in the boxing ring. The sales technique of their owners is almost as varied as the ware and almost always accompanied by much affectionate handling of the dogs. “It’s good for business and sometimes they mean it,” we were told by an impartial vendor of bird-seed who has been on the same pitch for twenty years. “Hi, mate, buy a dog to keep you warm!” said the man with the Chows to a pair of shivering Lascar seamen. “E’s worth double, lady, but I want ‘im to ‘ave a good ‘ome” or “Here’s a good dog, born between the sheets, got his pedigree in my pocket!” “Who’d care for a German sausage? – stretch him to make up the rations”, the salesman with the dachshund said, demonstrating too painfully for amusement. R.S.P.C.A. interference is needed less often now. The days are gone when sores were covered with boot polish; when doubtful dogs were dyed with permanganate of potash; when, as tradition has it, you could enter the market at one end leading a dog, lose it half way, and buy it back at the other end. In fact the regular dog hawkers were never the ones to deal in stolen pets. “Stands to reason, this is the first place they’d come, and besides, look at the number of coppers there are about anyway.” But it is still possible to buy pedigree forms “at a shop down the road”, “just a matter of thinking up some good names and being able to write”. 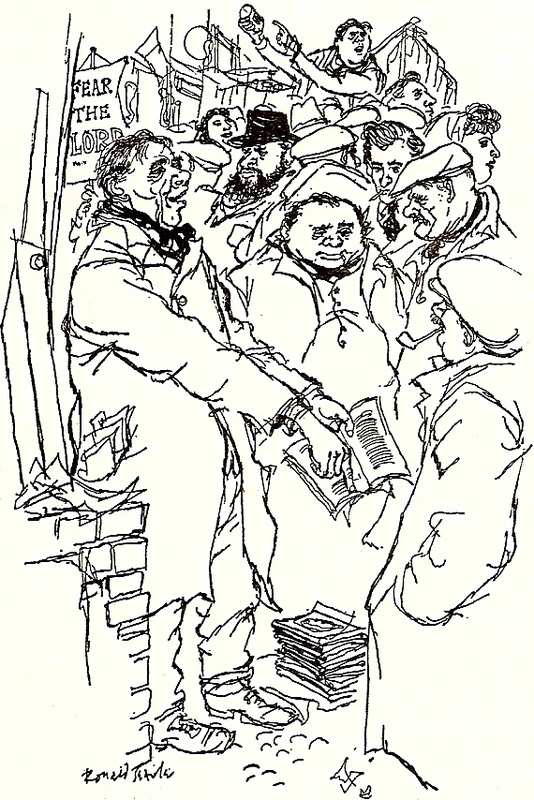 The regular merchants, whose most frequent customers are the pet shops, are mostly old-timers ( some who have been coming for forty years and from as far away as Southend) and since a new law was passed insisting that all animal sellers should have licences, the ‘casuals’ are forbidden. But on the occasion of our visit the law had not yet been made and we passed quite a number of them. Most attractive was a red-cheeked lad with a spaniel puppy – “I call him Gyp; we’ve got his mother, but there’s no room for another, so my uncle said to come here.” Every time he was asked: “How much do you want, son?” he stumbled over his answer and hugged the dog closer. And when the would-be buyer moved on, his eyes sparkled with relief. That day the dog section of Club Row was not very busy; it was too cold. But the rest of the market waxed as usual. Unlike its near neighbour, Petticoat Lane, Club Row Market has a strong local flavour. The outsiders who make the long journey to its “specialised streets” are mostly purposeful men looking for that mysterious commodity known as Spare Parts. We found one street devoted to firearms, chiefly historic, and another where secretive, urgent men offered us “a good watch or knife”, implying that it was “hot” and therefore going cheap. But we had learned that this was “duffing” and the watch was most probably exactly the same as those sold on the licenced stalls just up the street. At ten to one the market reaches a crescendo. One o’clock is closing time and many of the stallholders won’t be back until next Sunday. This is the time when the regulars know where to find bargains, but it needs strong elbows. Our way out, along Wheler St, under the railway bridge and past the faded notice which says ‘Behold the Lamb of God Cometh”, brought us back to the dog market. It was surprisingly quiet. On the other side of the road we spotted a small figure hurrying off with the spaniel puppy. It looked as if Gyp was safe for another week anyway. I hope you will not consider it vain if I reveal that Kaye Webb gave me this book and inscribed it under the title with my name and the text ” – also a person worth meeting!” It was my good fortune that Kaye, the legendary editor of Picture Post, Lilliput and Puffin Books, was the first person to recognise my work and encourage me in my writing. When I used to stay with her in her flat overlooking the canal in Little Venice, I remember she had some of Ronald Searle’s work framed on the wall in the spare room, and I spent many hours admiring both his Japanese prison camp drawings and his portraits of the bargees from the Paddington basin. Kaye’s marriage to Ronald Searle ended in 1967 and she died in 1995. Today, I keep my copy of “Looking at London and People Worth Meeting” on the shelf as an inspiration to me now I write pen portraits myself, and I sometimes think of Kaye here in these streets over half a century ago and imagine Ronnie – as she referred to him – bringing out his sketchbook in Sclater St where I buy my fruit and vegetables each Sunday. Gentle Author, you and Kaye have taken me back down the vista of years. As a small child I was taken to Club Row and nearby streets most Sunday mornings by my dad. 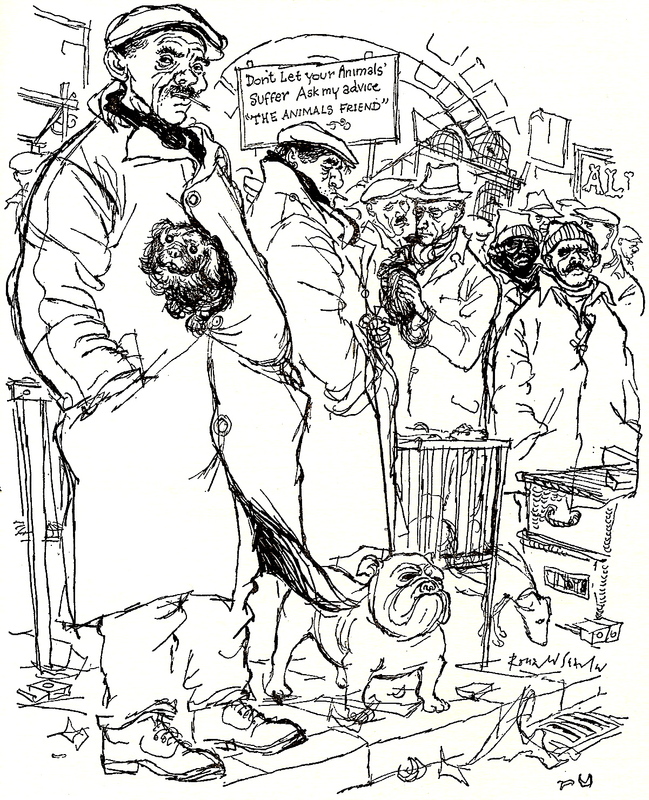 The sights, sounds and smells of those streets have been reawakened for me and Ronald Searle’s drawings are so evocative of those colourful traders and hawkers. My uncle had a ‘wireless’ stall in the market and I can still remember the joy I felt when my dad bought me my very first small, white radio there. Happy days and happy times. being a very ardent Puffin Books fan I remember meeting Kaye Webb as a kid….to learn here that she was with Ronald Searle makes so much sense in terms of the art work in Puffin books. I think I met her at a wonderful children’s bookshop on Kensington Church St.
At school, we were studying A Kestrel for a Knave. I was desperate to own a hawk, like Billy in the book. Our budgie – called Toby – didn’t really cut the mustard. So I headed for Club Row one Sunday with the idea to buy a hawk. I would worry about how to get it past my parents later. They didn’t have any hawks, so i settled for a racing pigeon. Took it home in a cardboard box, and hid it in my bedroom cupboard. when I came home from school Monday evening, my mother demanded to know why I had a bird in my toy cupboard. I can’t remember the excuse I gave, but anyway she told me the poor thing was desperate for a drink and she had released it to go live with all the other wild pigeons in Bethnal Green. I remember there were always a group of protesters with placards, chanting and shouting out to customers and stall holders. I thought they were spoil sports, and should mind their own business. But as an adult now, who cares a great deal about the welfare of animals, I can see that something needed to be done about Club Row.